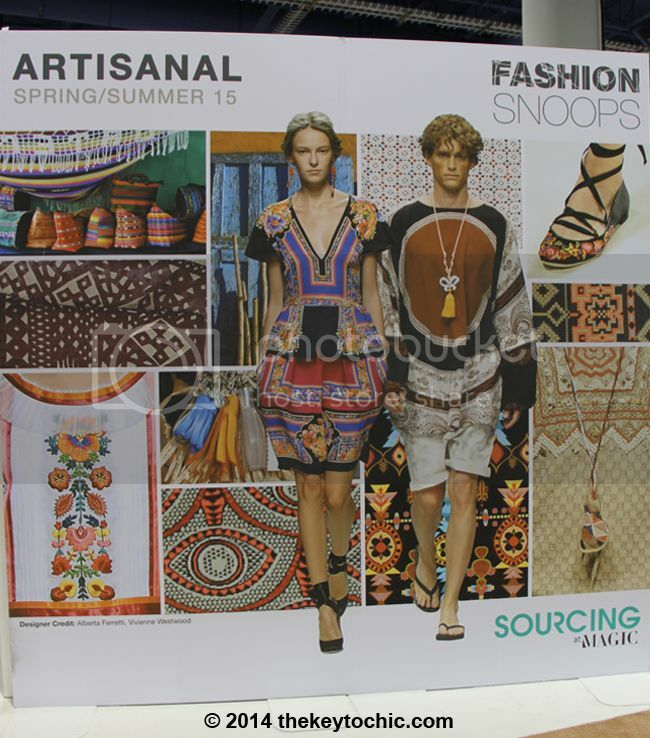 Each season at MAGIC Market Week, I look forward to visiting the Fashion Snoops trend gallery in the Sourcing area. Fashion Snoops, a New York-based fashion forecasting company, does a great job of presenting a trend seminar and predicting four key trends for the following year, complete with sample fabrics, Pantone color swatches, compelling graphics, and inspiring imagery. Each season, their informative trend seminars are packed with buyers, retailers, designers, students, and merchandisers eager to hear what will be trending a year from now. With my background in trend forecasting and my passion for wanting to know what's next, you can imagine how much I enjoy their presence at the trade shows. What will we be wearing for spring and summer 2015? Well the four key trends that they are calling out are: Artisanal, Thrift Shop, Avant Pop, and Streamline. Let's get to know more about each trend. According to Fashion Snoops, "there is a regal sensibility in the Artisanal theme, as repeated geometric patterns and linear border designs create a majestic visual appeal. Rich jewel tones are infused with intricate florals, while lace, suede, and jacquard fabrics help to evoke the elaborate nature of the trend. Texture becomes one of the most important qualities, and artisanal accents like fringing and embroidery create a luxurious look." The Artisanal trend reminds me of the Renaissance trend they featured for fall winter 2014-2015 because they both highlight rich fabrics and complex prints with an abundance of detail. The trend mixes inspiration from different cultures and uses bright colors mixed with neutrals. Embroidery, crafts, appliqué, embellishment, and 3-D florals are important to Artisanal. Materials include: suede, leather, jacquard (such as on this bright striped top), lace, and eyelet. Patterns are folk artisanals, repeated geometrics, updated flora and fauna, blanket stripes, and border designs (see this maxi dress for a border design example). Key items for Artisanal are: the embellished boxy top, shift dress, the full skirt mini dress, and the embroidered tunic top (this one is pretty). Accessories include: embossed metal accents, tassels (I adore these tassel earrings), studs, beadwork, brocade, embroidery (like on these espadrilles), suede, fringe bags (this one is cute), embellished slip-on shoes, saddle bags, the elongated tote, the statement necklace (this tassel style is noteworthy), and zodiac jewelry. Retailers to reference for the Artisanal trend are Anthropologie, net-a-porter, Free People, and Topshop. With Thrift Shop, the second trend, "retro inspiration shifts into a new direction, effortlessly combining classic comfort with a polished aesthetic. A vintage-hued color palette mixes with pops of kitschy color in conversational prints, while materials such as French terry, crisp poplin, and faded denim are heavily featured. Patterned fabrics (such as these patchwork jeans) create a craft-inspired look, and suede patchwork complements artful embroidery for a new spin to the thrifty feel of the theme." Colors are retro muted, with sophisticated silhouettes and retro pieces. Materials include charmeuse, laser cuts (see this tee), and suede, while prints include kitschy bird and cat prints, as well as embroidery on sheers. This is where you can source pieces from thrift shops and reinvent them in a modern way. Key items include: the oversized coat, pencil skirt, the shirt jacket, and the printed full skirt dress (such as this beautiful version). Accessories include: distressed leather, frayed canvas (such as on this cute hat), platform sandals, and colored skins. Retailers that serve as great examples of the Thrift Shop trend are Modcloth, Threadsence, Asos, and Topshop. The third trend, Avant Pop, is the most bright and colorful. It evokes a happy mood and creative energy with a strong art influence, as seen on the spring 2014 Chanel runway. As Fashion Snoops describes, "it combines animated hues with abstract art, bold prints and daring fabric manipulation. It is an expressive theme that fuses eye-popping visuals with Surrealist imagery, as experimentation in art and design present unlikely juxtapositions. Asymmetric silhouettes and Pop Art-inspired faces are accentuated by jewel embellishments for a 3-dimensional hyper-realism effect, while textured fabrics, bright colors, outlandish motifs, and mixed media elements create a walking art gallery." Exaggerated colors and bold graphic placements are hallmarks of the trend. Bold new color combinations add life to Avant Pop. Important colors include: kelly green, royal, bright yellow, and tangerine. Materials for Avant Pop are double knit jerseys, PVC, nylon, sequins, playful jacquards, stretch jersey, and burnout patterns. Key graphics include: Pop Art faces as seen on the spring 2014 Prada runway, mixing prints, updated stripes, color blocking, and Surrealism. Playful camos, reinvented florals, graffiti art, and big licensed logos (such as this one) figure prominently. 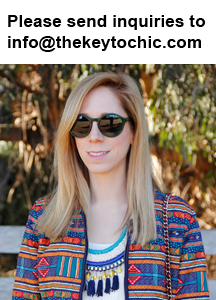 Key items are: the embellished dress, the boxy top, the dirndl skirt, the patterned jacket in tweed (ideal example here), sateen crop tops (I love this colorful one), boxy jackets, and criss cross tops like this one. Accessories have room for creativity and reinvention. For example: ribbon weaves, patent leathers, mixed media, painted silk, and geometric burnouts. This clutch is a great example. Shoe trends include painted pumps, playful sneakers, and shark tooth soles. See Topshop, Boohoo, and Nasty Gal for more examples of Avant Pop. Acting as an antidote to the three trends above, Streamline "defines a minimalist approach to design, where sophisticated, simple silhouettes create an ultra-modern appeal underscored with a relaxed, athletic attitude. Parachute nylon, mesh, and foamy textures appear in soft, muted tones, and are accentuated by transparent layers, contrast trims, and industrial zippers. Cotton shirting and organza add further interest, while subtle styling creates a refined interpretation of this slick aesthetic." 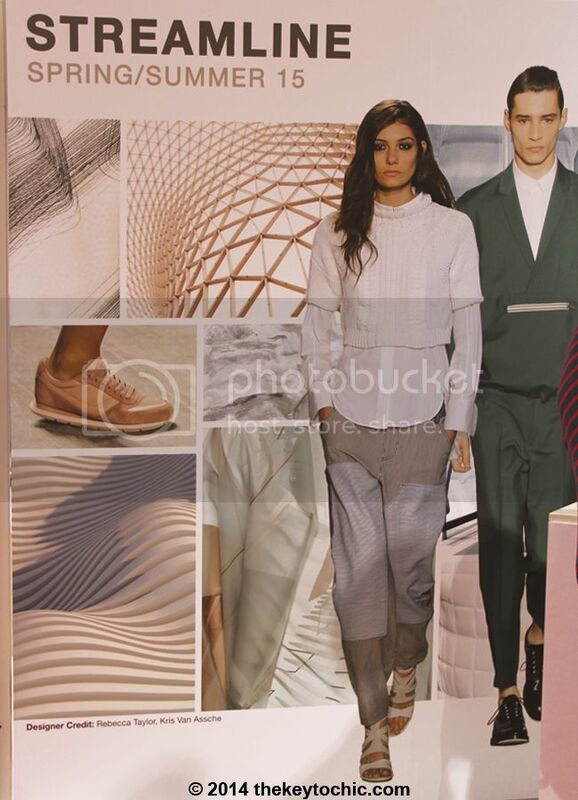 Think of it as a softer, more grown-up version of the Pro Sport trend as featured for fall 2014/winter 2015. It's a trend with an active feel and clean lines. Mesh, dressed-up zip hoodies, and neutral colors are key to Streamline. Colors include: grays, skin tones, blues, and neutral tangerines, and navy. Materials are: cotton shirting, chambray, lightweight denim, nylon, mesh, and sheer knits. Prints are minimal, and they include: muted animal patterns and muted stripes, and active blocking. Key items are: the cropped shirt, statement sweatshirt, wide leg denim pants, shirtdress, A-line skirts, Bermuda shorts, boy blazers, modified sweatshirts (see this glam version with furry sleeves), the sporty bomber jacket (see this paneled jacket as an example and this color block one), and baggy boy shorts (like these). Accessories include: piping, bungee cords, simple slip-on sandals, clean nylon sneakers, and statement neckbands. Browse Adidas, J.Crew, Reiss, and Forward by Elyse Walker for more examples of the Streamline trend. *For more photos of each trend, including color samples, key items, and fabrics, head on over to my fashion trend boards on Pinterest and like my Facebook page, where I'll be sharing exclusive photos, trend info, and shopping reports. **Check out Fashion Snoops for additional trend reports, subscription services, and more fashion forecasts. ***Read my fall 2015/winter 2016 fashion trend forecast, my spring/summer 2016 fashion trend forecast, spring 2016 trends for Juniors, or childrenswear spring/summer 2016 forecast for additional trend insight.